There is an old story about Henri Dutilleux which I cited in my review of the Capriccio recording of his Symphony No.1. I do not hesitate to recall it here. Alex Ross in his book The rest is noise (2007) related the incident that when Dutilleux had ‘presented his vibrantly diatonic First Symphony, [Pierre] Boulez greeted him by turning his back’. The cause of this slight was that Boulez believed that his path of producing works using the ultimate expression of the twelve-tone method, ‘total serialism’ was the only musical discipline in town. Everything else was old fashioned and deserved to be destroyed, or at least forgotten. As I wrote then, ‘there were other trajectories in French music at this period including the post-war achievements of ‘Les Six’ and the ‘last impressionist’ Maurice Duruflé. It is easy to generalise, but Henri Dutilleux is in a direct line of descent from Debussy and Ravel, by way of Albert Roussel. Yet this is not the whole picture: Dutilleux was not afraid to pick up techniques that he could effectively use. Whilst eschewing the radical avant-garde, he made use of tone-rows and jazz.’ In other words, Henri Dutilleux was very much his own person. Henri Dutilleux’s Symphony No. 1 was composed in 1951. It was his first large-scale work for the orchestra. The Symphony was premièred at the Théâtre des Champs-Élysées in Paris on 7 June 1951. Roger Désormière directed the Orchestre de l’Office de la Radiodiffusion-Télévision Française. It is unusual to begin a symphony with a ‘Passacaglia’. The composer presents some 35 repetitions of the opening ground bass with great variety. The movement is in an arch form, opening and closing quietly, with a vibrant rhythmic middle section. Enjoy the jazz-band influenced brass chords. The ‘scherzo’ is a will o’ the wisp ‘moto perpetuo’ creating a powerful balance of energy matched by a magical fleet-footedness. This is followed by a gently unfolding ‘Intermezzo’. It is an exploration of some exotic and introverted thoughts. Nevertheless, this is beautiful music that has the power to enchant. The ‘finale, con varizioni’ opens with a huge chorale. This soon calms down and is followed by a set of variations based on a theme not dissimilar to the preceding ‘Intermezzo’. The Symphony closes with dignity and quiet confidence. Three things make this an excellent symphony. Firstly, Dutilleux’s technique allowing the music to evolve rather than the use of a ‘prefabricated formal scaffolding.’ But this goes further; it is not just the transformation of themes and motives, but the impression on the listener that the musical material is being constantly renewed. Secondly, the music has the feel of being an improvisation. This gives a freshness and sparkle that is captivating. And finally, there is his masterly use of the orchestra. Dutilleux has used massive forces with a whole battery of percussion and a vast woodwind section to considerable effect. Métaboles was completed some 14 years after the Symphony No.1. It gestated over a long period, having been begun in 1959 as a commission from George Szell and the Cleveland Orchestra as part of their 40th anniversary celebrations. The completed work was finally given its premiere in January 1965. The title is important, as it defines the entire compositional process. The Greek word Métaboles suggests change and restructuring. It would have been equally appropriate to have called the piece ‘Metamorphoses’, however this title had been used by Paul Hindemith and Richard Strauss. The liner notes explain that Métaboles refers to ‘the biological process of metabolism which relates to the way in which the first movement’s initial theme is gradually and substantially transformed until a new version becomes the theme of the second movement.’ This process is then carried forward into the next movement and so forth. In fact, there are five sections all of which overlap: ‘Incantatoire’, ‘Linéaire’, ‘Obsessionel’, ‘Torpide’ and ‘Flamboyant’. These moods largely define the progress of the work. Once again, the composer’s idiomatic use of percussion adds colour to this shimmering and translucent score. Les citations for oboe, harpsichord, double bass and percussion was developed over a long period of time. Initially, it was short piece composed to honour the 75th birthday of Peter Pears. There is a quotation from Act One of Britten’s opera Peter Grimes: the recitative beginning ‘Now the Great Bear and Pleiades …’. It was then entitled ‘For Aldeburgh 85’. During this period, Dutilleux was composer-in-residence at the Festival. Dutilleux was not happy with the work: he felt that it was too insubstantial. So, he withdrew it until 1990 when he enlarged the ensemble with a double bass and provided a ‘second movement.’ This was entitled ‘From Janequin to Jehan Alain’ and was written in homage to the French composer and organist Jehan Alain, who had died at Saumur, France in 1940. There is a short quotation from Alain’s Thème varié for piano. Clément Janequin was a Renaissance composer whose music has been quoted by Alain in an organ work. 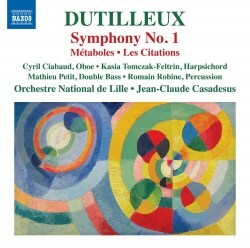 The sounds that Dutilleux commands from the oboe and the other instruments is both colourful and imaginative. The players bring a special magic to this music. The harpsichord is stealthy in its explorations, the oboe is often wayward, the percussion surreal and the double bass provides a jazz-infused commentary. A thoroughly enjoyable work, even if it is strangely gnomic in its effect. The liner notes by Paul Conway are helpful in every way, both as an introduction to Henri Dutilleux and to his music. I have noted above the splendid playing in Les Citations. The entire CD exhibits impressive performances from the Orchestre National de Lille and their conductor Jean-Claude Casadesus. The recording is excellent with great clarity throughout but especially so in the translucent music of Les Citations. All in all, a great CD and a splendid addition to the Naxos survey of Henri Dutilleux’s music. There are several versions of all these works available on CD: I have had the opportunity of listening to a few of them. However, the present CD is satisfying in every respect. I look forward to further releases in this series.